Cambridge, UK and Pittsford, NY – 29 February 2016: The new R6 generation of MEDUSA4 is now available after extensive development work. The wide range of functions in the CAD software now offers even greater benefits and the new, ergonomic design simply makes more fun for users. MEDUSA4 has always evolved on the basis of customer requests and their industry-specific requirements. A number of beta testers have been able to follow and influence the developments right from the start. Their feedback has helped to create the best MEDUSA4 version ever. The latest generation of the 2D/3D CAD software has now been launched onto the market with MEDUSA4 R6. A design solution that will simplify work going forwards and make users even more productive. The new MEDUSA4 R6 not only looks modern, but is also very comfortable to work with. Design times are reduced because existing functions have been refined and a dashboard has been included in the user interface. The clearly organised dashboard, which is always related to the task in hand, is available at all times and enables assignments to be completed much faster. In the arrangement of individual functions, particular emphasis has been placed on shortening mouse paths and on greater automation. The menus in MEDUSA4 can now be modified by each user, which in turn further raises individual productivity. Even the standard configuration of MEDUSA4 R6 provides an optimum CAD solution for all design requirements. That is further enhanced by the industry-specific modules that can be added to the standard packages. However, every company is different and each department has its own remit that does not always fit into a standard template. The latest generation of MEDUSA4 is able to cater precisely for these specific needs; the software architecture provides great flexibility and plenty of room for integration or automation. CAD Schroer is releasing a new generation of MEDUSA4 software across the globe with immediate effect. MEDUSA4 R6 can be simply downloaded from the Internet. 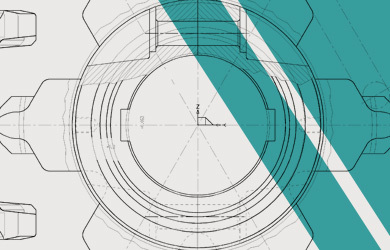 Everyone can now experience the latest generation of the CAD software at first hand and get an idea of the many new features contained in MEDUSA4 R6. Video tutorials are available for CAD beginners. MEDUSA4 steps into a new generation with the R6. 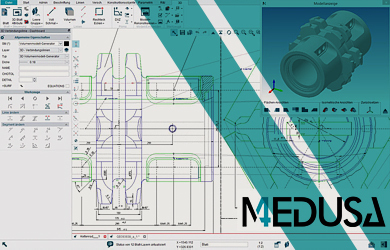 The latest MEDUSA4 R6 is in all respects a completely optimised, highly improved, version of the CAD software which has proved itself throughout the world. 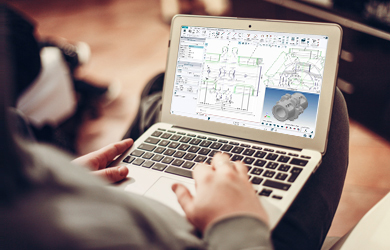 CAD Schroer has set clear standards in design, ergonomics and technology with its latest software generation and thus invests in the future of its customers.